I presented at Woodside High School’s a few years ago – talking about my career in financial planning. The kids were terrific and the staff put on an event packed full of presentations by colleges, trade and art schools and career advice from community members. One of the other presenters is a financial aid counselor at Stanford who has started teaching a personal finance class to graduating seniors at Stanford. The curriculum requires students to create a budget based on their research of actual living costs – tax deductions from salary, health insurance, dental bills, food, rent – and assumes a salary of $45,000. She started offering the class after receiving many surprising questions from students, including one student who wondered whether to call the police about the money his employer was taking out of his paycheck. She realized these well-educated students were lacking some essential, practical life skills. Following is an article from the Financial Planning Association (FPA) with helpful tips on parenting opportunities to teach financial life skills. Techniques for teaching children the value of a dollar include providing an allowance, encouraging children to save a portion of their allowance, chipping in a percentage of savings as “interest,” helping children to establish a bank account, and establishing a lending agreement, with interest, when children want to borrow money from you. Start teaching your children at a young age that money is earned by working and that you should spend less than you earn. To help them understand what it’s like to get paid on a schedule, you may want to begin paying an allowance. Then help your children set goals for how they spend and save their allowance. It’s important, however, to make sure that you stick to the payment schedule; otherwise your lessons about financial responsibility may be undermined. Experts differ on whether or not allowances should be tied to household chores. Although many people say children will learn more about personal responsibility if they are not paid for pitching in around the home, others feel it teaches them valuable lessons about working and earning. 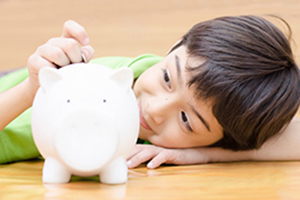 You should also encourage your children to save a portion of their allowance for a special goal, even if they’re just putting money in a piggy bank each week. As they save money, you might reward them with a small additional amount, just like a bank pays interest. At the end of each month, calculate how much your children have saved and then chip in a certain percentage as interest. To reinforce your discussions about saving, you might also consider plotting a visual chart of their savings so they can easily monitor their financial progress. Most community banks will allow children to open first accounts with low minimum deposits. Some even have accounts especially marketed to kids to make the learning process fun. Make sure that your children receive an online or printed statement so they can see the progress of their savings efforts, as well as the interest that accrues. When your children want something that they can’t quite afford, discuss the value of saving versus borrowing. If you do extend credit, use a written IOU, establish a repayment schedule, and charge interest. By doing this, you’ll be teaching them about financial responsibility. As your children get older and perhaps take on part-time jobs to earn more money, their savings will likely amass at a quicker rate. This is an ideal time to review the lesson of compounding, or the ability of earnings to build upon themselves over time. Explain how compounding can be more dramatic over time; the longer money is left alone, the greater the effect. This can lead into a discussion about investing and risk — how certain investments with a greater ability to compound over time may also entail greater short-term risks. As Benjamin Franklin once said, “An investment in knowledge always pays the best interest.” So remember that answering your children’s questions honestly and in terms they’ll understand can help them begin life on sound financial footing. Because of the possibility of human or mechanical error by McGraw-Hill Financial Communications or its sources, neither McGraw-Hill Financial Communications nor its sources guarantees the accuracy, adequacy, completeness or availability of any information and is not responsible for any errors or omissions or for the results obtained from the use of such information. In no event shall McGraw-Hill Financial Communications be liable for any indirect, special or consequential damages in connection with subscriber’s or others’ use of the content. This column is provided through the Financial Planning Association, the membership organization for the financial planning community, and is brought to you by Emilie R. Goldman, CFA, CFP ®, a local member of FPA.